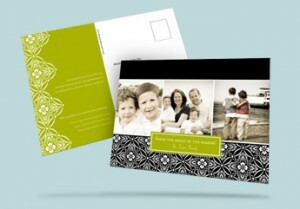 Our Featured Favorite for July is a Christmas card. Yes, you heard that right, it’s Christmas in July. Our forward thinking customer, Jamie, scheduled a family portrait session on the beach during the summer because their family loves boating and being on the water. “We own a sailboat and have many adventures on it!” She loves the way the photos turned out because they “show my boys’ personalities so well.” Finding the right card to showcase her photos was easy. “I wanted a postcard format and loved the look of this Kaleidoscope Vision Christmas Card. I liked the design and colors as well.” The quote on the back was a favorite of hers that tied the photos and boating theme into a beautiful holiday message. Jamie is quick to admit that she doesn’t get her Christmas cards done this early every year. But, we say, if you have a great summer photo to use, why not get them done in July? “It is one less thing that I have to add to my holiday “to-do” list! Anything to make life a bit simpler!” Of course, Jamie adds, “I won’t send them out until early December. I have a while to address them and buy stamps.” Better not wait. The holidays will be here before you know it.